And putting other birds to flight. The dogs must answer one’s command. And then the goal is lost to sight. 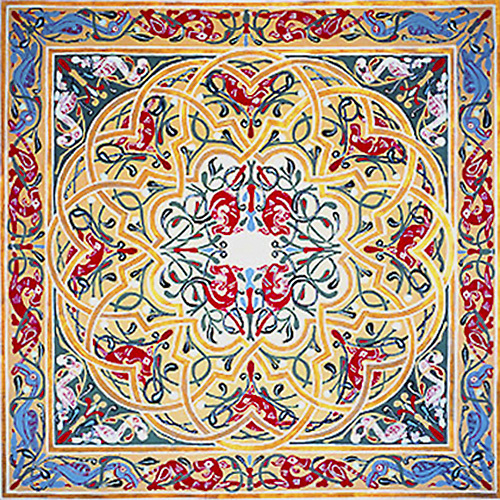 T he design of profound and symbolic pattern making is now a degraded art in the developed West. Since the Middle Ages has been relegated to the ‘inferior’ world of decorative craft – aided by a lot of over use in the Victorian age. 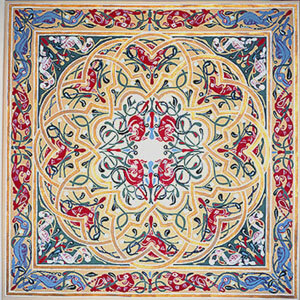 In the traditions of craft throughout the world art is not seen as a separate activity and is still practised. 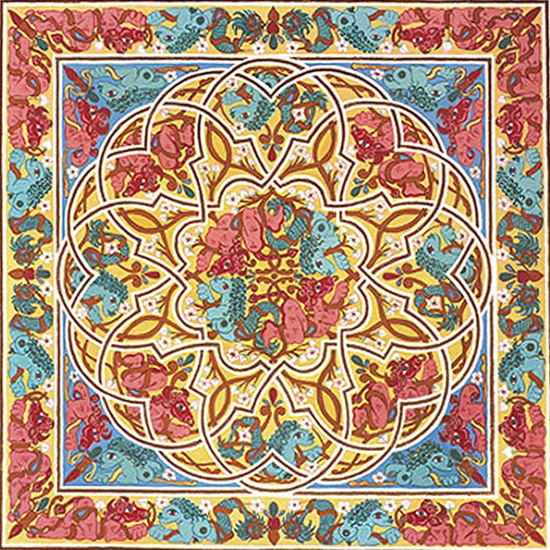 We have lost the art of judging the results but Islamic art with its elegant geometry supporting the intertwined and intricate islimi (arabesque plant forms) was a great inspiration to our most famous Arts and Crafts Designer – William Morris. 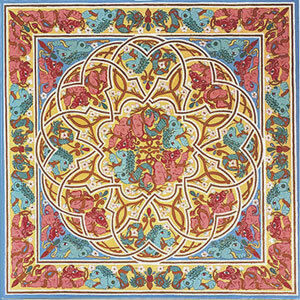 Mandalas appear in all the sacred traditional art forms of the the world in one form or another and are symbols of our need to make creative order out of chaos. They are often used as meditative devices to aid prayer and still an important part of Hindu-Buddhist traditions. Carl Jung noticed that his schizophrenic patients would create them in the process of their treatment. 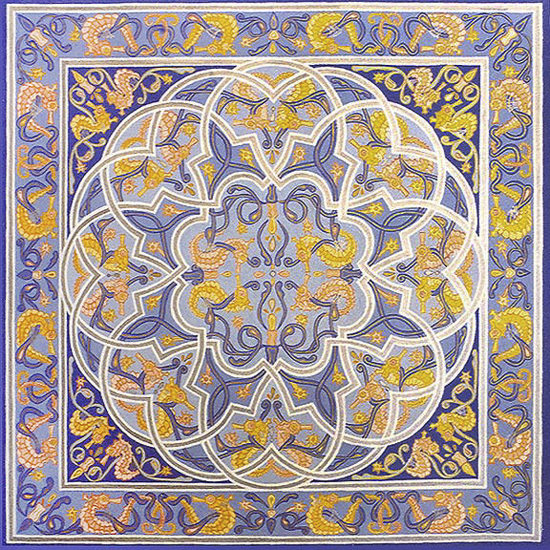 My decorative gouache design work draws on the geometric principles that were part of my MA work in Islamic and Traditional Art at the Royal College of Art. I have a particular interest in the imagery and stylisation of Celtic Art with its hunting motifs of dogs and birds in mortal combat. I prefer to interpret the pursuit more humorously. My work is narrative as well as decorative and uses the form as a means by which a story can be told. 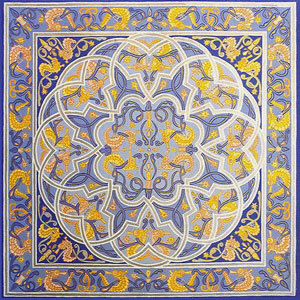 The overall geometry is taken from a Moroccan Koranic frontispiece from the 16th century. The Mating Game (A Seasonal Romance in Four Acts) begins with Winter – The Hunt. It continues in three more large gouache pieces reflecting Spring – The Dance, Summer – The Kiss, and Autumn – The Embrace. These are based on a fatal attraction between natural enemies and the poem above was the starting point for the sequence. The chase begins in the winter with equivalent imagery and colour and ends in autumn with some kind of reconciliation of opposites bearing fruit. The stories work from the inside to the border and can be read as the viewer wishes. Other large gouache pieces are based on stories of mismatched pairs – the seahorses in ‘Seahorse Sonata’ are attracted and then repelled by each other but seem to be tied by their tails. In ‘Mermaids and Minotaurs’ the Mermaid leads the Minotaur a merry dance but in the borders she eventually catches him through the ring in his nose. I also make smaller gouache mandala designs to commission based on the personal preferences of my clients. You can see more of these in the Gallery attached to Mandalas page.